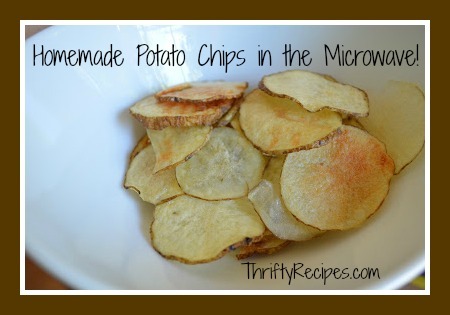 These chips are delicious as a snack and also make a great side with lunch or dinner. They are best eaten right after cooking, but they are so easy you can make them any time. Make them with plain salt or use your imagination and try garlic salt, seasoning salt, pepper, parmesan cheese….you name it! Scrub potatoes well. I leave the skin on, but you can peel the potatoes if you like. Slice as thinly as possible. If you have a mandoline or other slicer, use it to make the slices more even (but a knife works just fine). Spray a microwave safe dinner plate with cooking spray (if you used a lot of olive oil you can skip the spray, but I like to use less oil). Spread the slices in a single layer. If you have any thicker slices, put them on the outer edges. Microwave 3-4 minutes (depending on the power of your microwave) until slices begin to look a like they are cooking. Flip the slices over – CAUTION they will be very hot! Cook another 4 to 5 minutes or until just slightly golden. The chips will continue to crisp up after you take them out of the microwave. Potatoes are on of the best foods to stretch your budget. 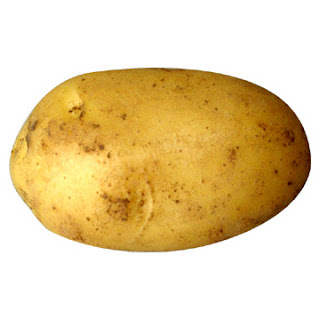 Not only are they inexpensive, but potatoes are packed with nutrients, especially if you leave the skins on! Heat oven to 450 degrees. Scrub the potatoes well. Cut into slices appx 1/4″ thick. Turn the potato and cut each slice in 1/4″ as well, leaving you with 1/4″ x 1/4″ fries. For optimal results, soak the fries in cold water for 30 minutes. 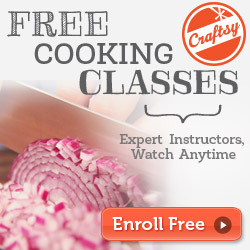 (If you don’t have 30 minutes, even a 5 minute soak helps to remove excess starch which results in a crispier fry.) Drain water and wrap potatoes in a clean dish towel to remove excess water or spin them in a salad spinner. Place the potatoes on a baking sheet (heavy, dark colored sheets are the best). Pour oil on potatoes and season with salt. Toss to evenly distribute the oil. Bake 15-20 minutes or until fries are golden brown, turning at least once.